Believe it or not, the Denver Nuggets are at their best with Nikola Jokic operating as their best player. Crazy, right? While that may seem unbelievably simple for some, for the 23-year-old goofy and un-athletic center who is perfectly dubbed “The Joker”, the transition from best-kept secret to a bonafide star player on a potential playoff team has been difficult for Jokic. Learning how to become a leader is tough enough, but doing so on the fly in the midst of a battle for playoff contention is a different matter entirely. Yet, somehow, Jokic is adapting, learning, and evolving on the fly. Back on the night of March 27th, the Nuggets had lost in heartbreaking fashion to the Toronto Raptors for their fourth loss in the last six games. Reaching the playoffs for the first time since 2012-13 suddenly seemed preposterous, if not nearly fanciful. Enter Nikola Jokic, who has since led Denver to a 6-0 record and in a position to successfully return to the playoffs after a four-year absence. In those six games, Jokic is producing at an outrageous rate with averages of 23.7 points, 13.3 rebounds, 8.2 assists, 1.7 steals and 1.5 blocks over 38.5 minutes a night while shooting 50.5 percent from the field. 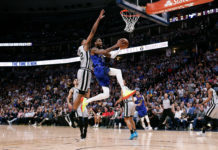 “I just feel like he wanted to step up and play better,” Will Barton said when asked about Jokic’s sudden inspired play leading to the Nuggets’ resurgence. Jokic has stepped up and played so incredibly well that his head coach is now proclaiming him is one of the best players in the entire NBA. 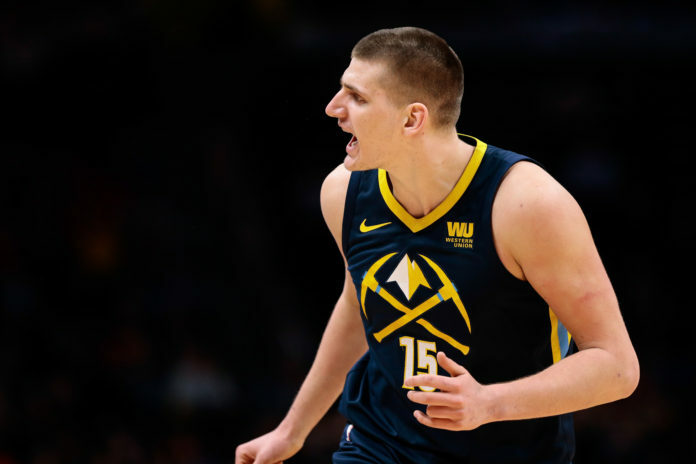 “When Nikola plays aggressive — whether it is scoring, rebounding or playmaking — he is one of the best big men — one of the best players — in the NBA,” Nuggets’ head coach Michael Malone said when asked about Jokic’s spike in assertiveness. That six-game winning streak most recently featured the Nuggets’ massive win over the Portland Trail Blazers in which Jokic put up 15 points, 20 rebounds, 11 assists, and two steals. Incredibly, that stat-line has only been done four times in the history of the NBA: once by Kareem Abdul-Jabbar, twice by Nuggets’ legend Fat Lever, and Jokic, who has done so twice in just the 2017-18 season alone. To say Jokic was aggressive against Portland would be quite the understatement. The Nuggets’ matchup with the Trail Blazers was a must-win if Denver wanted to continue to control their own playoff destiny. 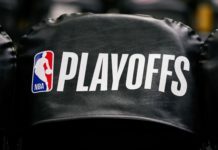 For the Nuggets to defeat the third-seeded Trail Blazers, Jokic was going to need to play well, but — considering that Denver shot so badly from the floor and were unable to get anything going offensively — Jokic needed to put the burden on himself to carry his Nuggets’ team to a win when they needed it most. After Jokic’s 15-point, 20-rebound, and 11-assist triple-double on the way to Denver’s sixth-straight win, it is becoming more than apparent that Jokic is the best player on the Nuggets and the sooner he accepts that the better. Jokic is so selfless and altruistically-minded that he has trouble accepting that he is the leader and most important player on the roster, but his teammates are now demanding that he act accordingly. When three of Jokic’s teammates were asked if Jokic needs to be the Nuggets’ best player, they all had identical answers. 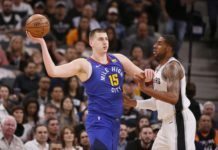 It has been clear to almost all who have watched the Nuggets play at their best that Jokic is their most important player, but the one hold-out that refused to accept that was Nikola Jokic himself. When he is asked about anything related strictly to his own individual play, he redirects the answer. Jokic just refuses to ever take credit for how good he is. While he still refuses to take credit for his accomplishments or positive impact, that is what makes Jokic such an incredible player. He may never fully accept that he could be one of the best players in the entire NBA, but as long as he remains the unadulterated version of himself, the Nuggets are in good shape for years to come. “For me, it is like every other game,” Jokic said after putting up yet another historically great stat-line.